In the last few years, I’ve had to be more creative in how I stress my body through exercise. My older joints won’t allow me to lift heavy weights or run frequently anymore, but I still need to push myself to maintain the fitness necessary for the stresses of military life. But I’m okay with that. I’ve learned to use the stress of exercise to build my spirit & relationships. Adjusting my workout for my weaker body is humbling, but the slow and intentional exercise has been life-changing for me. I use cardio routines to reflect on perseverance in Christ. But my knees and back will only let me run about once a week, so I might do 20 minutes on the elliptical, 20 minutes on the stair-climber, or a similar time on the stationary bike and do shallow lunges and “fire-engines” as I walk home. And when I feel pain where the members of my body connect (Ephesians 4:15-16), I pray then and there for the specific pains of “connection‟ in the Body of Christ. I also stress my bad shoulder differently. To remember the need for flexibility with my brothers and sisters, I work with light dumbbells for a fuller range of motion for 2-5 minutes per set. I may lay on a flat bench with the weights and slowly move my arms like I’m making a snow angel. When I begin to reach burnout, I may shift to a circular rowing motion, all the while meditating on the connections of my body’s parts and flexibility in the Body of Christ – even when it hurts. The recurring theme of W.A.I.T. training is that physical and spiritual fitness cannot be separated because God put our spirits into bodies to experience and express relationship. We physically experience stresses such as sadness, fear and others‟ anger as we relate to each other, and our bodies are also the God-given tools to express the same from our spirits. Your spirit will experience and express the stress of genuine relationships through your body. In order to bring constructive stress on my whole being, I take two approaches to exercise. The first is to exercise with a partner and have meaningful conversation about the spiritual and relational dynamics that we experience in our bodies. If I can’t find a partner, I use a mirror and my MP3 player with Scripture and specific Christian songs to meditate on the relational truths in my ears. The mirror serves as a visual cue to meditate on the wonderful and warped in God’s creation – pictures of the gospel and the impact of sin in my body. The Scriptures and songs help me meditate on His commands & promises. Again, the Body of Christ (all born-again followers of Jesus) is wonderfully created by God but warped and wounded by sin, so I incorporate praise and prayer into my workout. One of the ways I do this is by adapting the exercises to reflect the emotion of the passages or songs playing in the moment. If the content is about a close relationship, I may run faster on the elliptical like I’m running to the person. If it’s about a struggle, I may increase the weight or do more reps to remind myself to press ahead. If it’s on praise, I may use an exercise that lifts my hands heavenward. Be creative and stress your body to experience your actual spirit and express His Word. Wow! God will do whatever it takes for us to cling to Him as our safety, strength, and joy, including bringing the heat! Our Father disciplines (teaches) His children because He loves us (Romans 5:3-6, Hebrews 12:4-11, 1 Peter 1:6-9), and one way He encourages us to cling to Him is stressful situations: unexpected timing, new duties, losing a familiar resource, etc. 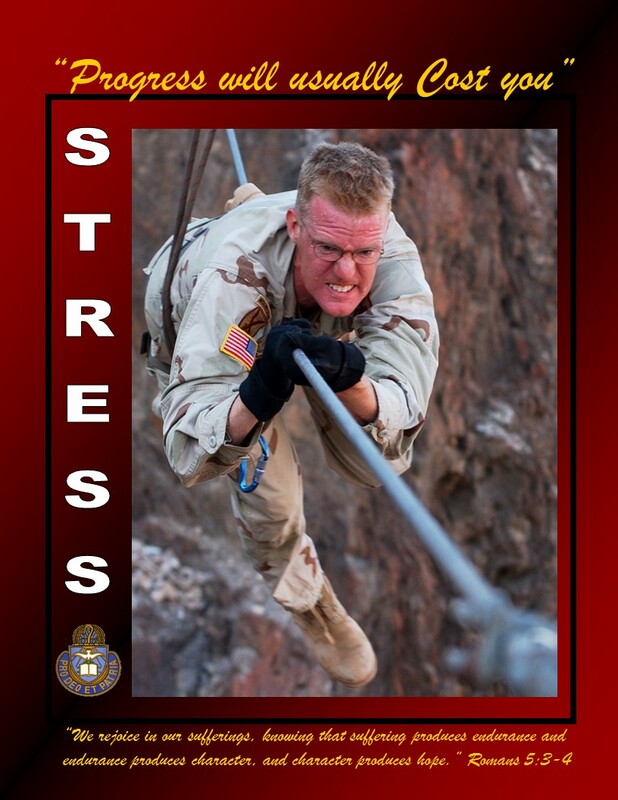 We can try to avoid our stresses – like Soldiers who know a PT test is coming but continue to slack off on their exercise and feast on fast food. We can see it as a human problem and seek more human solutions (more time at work, internalizing our anger even more, more reading about the problem, more friends who will take us away from the stressful situation, etc.). Or we can use the stress for a spiritual breakthrough to leave our comfort zones in this world and live in the Body of Christ. What is your fear? And who is your Love? W.A.I.T. Watch God’s creation for the realities of stress in your life. Accept these as spiritual messages for you. Team with His people to use the stress to grow in Him. If you’d like a free download to print and frame the picture at the top of this article, you can click here. And if you want to receive similar articles, you can subscribe to tools4trenches. This entry was posted in Workout Wednesdays. Bookmark the permalink.